Making a grant to a Canadian registered charity through your Fund is an easy process, and the Jewish Foundation team is always here to help. All grants are generally approved on a monthly basis. We will inform you by email or phone when the grant has been released. 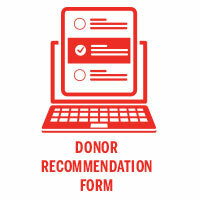 Is your grant supporting an event, a scholarship or a membership at an organization? Certain government rules may apply. If you are unsure if the organization you wish to support is eligible, please contact the Jewish Foundation.